Of the hogan where he lived. 3.99 first print then. 50 cents Per Print. See how people like our prints. of the hogan where he lived. 3.99 First Print then. 50 Cent Per Print. Using a stick to draw on the dirt floorof the hogan where he lived. Of the hogan where he lived. 3.99 first print then. Artist, R.C.Gorman Born on the Navajo Reservation, Gorman began drawing at an early age, using a stick to draw on the dirt floor of the hogan where he lived. Leaving the reservation as a young age, he became one of the most popular Native American artist Visit Our Store for other Gorman and Native American Prints Original Vintage Art Book Print/Plate Back Side is Blank READ OUR FEEDBACK See how people like our prints Shipping First Class Mail with Tracking Combined Shipping, 3.99 first print then. 50 cent per print Add all the prints you want to your cart then click pay Please email any questions Thank You for looking. Artist, R.C.Gorman Born on the Navajo Reservation, Gorman began drawing at an early age, using a stick to draw on the dirt floor of the hogan where he lived. Leaving the reservation as a young age, he became one of the most popular Native American artist Visit Our Store for other Gorman and Native American Prints Original Vintage Book Print/Plate These prints look Great Framed, With or Without a Matt SHIPPING USPS First Class Mail with Tracking We Do Combined Shipping 3.99 first print then. 50 cent per print Add all the prints you want to your cart then click pay Shipped Flat with Cardboard, Please email any questions Thank You for looking. Artist, R.C.Gorman Born on the Navajo Reservation, Gorman began drawing at an early age, using a stick to draw on the dirt floor of the hogan where he lived. Leaving the reservation as a young age, he became one of the most popular Native American artist Visit Our Store for other Gorman and Native American Prints Original Vintage Art Book Print/Plate Back Side is Blank READ OUR FEEDBACK See how people like our prints Shipping First Class Mail with Tracking Shipped Flat with Cardboard, We Do Combined Shipping, 3.99 FIRST PRINT THEN. 50 CENT PER PRINT ADD THE PRINTS YOU WANT TO YOUR CART THEN CLICK PAY Please email any questions Thank You for looking. Artist, R.C.Gorman Born on the Navajo Reservation, Gorman began drawing at an early age, using a stick to draw on the dirt floor of the hogan where he lived. 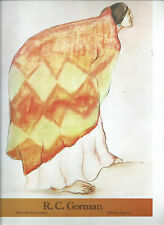 Leaving the reservation as a young age, he became one of the most popular Native American artist Visit Our Store for other Gorman and Native American Prints Original Vintage Art Book Print/Plate Shipping First Class Mail with Tracking Combined Shipping 3.99 first print then. 50 cent per print Add all the prints you want to your cart then click pay Please email any questions Thank You for looking. Of the hogan where he lived. 3.99 First Print then. 50 Cent Per Print. Artist, R.C.Gorman Born on the Navajo Reservation, Gorman began drawing at an early age, using a stick to draw on the dirt floor The Yellow on the second matted is the correct yellow Visit Our Store for other Gorman and Native American Prints SHIPPING USPS First Class Mail with Tracking Shipped Flat with Cardboard, WE Do.Combined Shipping 3.99 first print then. 50 cent per print Add all the prints you want to your cart then click pay Please email any questions Thank You for looking. Of the hogan where he lived. See how people like our prints. 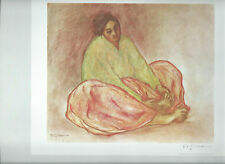 Artist, R.C.Gorman Born on the Navajo Reservation, Gorman began drawing at an early age, using a stick to draw on the dirt floor Visit Our Store for other Gorman and Native American Prints SHIPPING USPS First Class Mail with Tracking Shipped Flat with Cardboard, WE Do.Combined Shipping 3.99 first print then. 50 cent per print Add all the prints you want to your cart then click pay Please email any questions Thank You for looking. Artist :RC GORMAN (July 26, 1931 – November 3, 2005). Original Stone Lithograph on Arjomari Arches paper. The artwork listed here is HAND SIGNED and Dated 1978 in Pencil. NO EXCEPTIONS. Image / Mat interior : 20 ” x 16 ”. Of the hogan where he lived. 3.99 first print then. 50 cents Per Print. Back Side is Blank. Of the hogan where he lived. 3.99 first print then. 50 cent per print. See how people like our prints. Of the hogan where he lived. 3.99 first print then. 50 cents Per Print. See how people like our prints. Of the hogan where he lived.